What I would bake: A caramel apple upside down cake and it is something that I’ve made before. To elevat e it I might have done some sugar work on top. Of all the cakes that were baked, the ones that sounded the most delicious were Mengling’s and Devon’s but Megan’s sounded amazing. Wendy: Sticky Banana Upside Down cake with blueberry molasses and rum whipped cream. The whipped cream on Wendy’s cake melted and ran all over. Rochelle called it ugly but delicious. Andrei: Rhubard Parquet Upside Down Cake. Rochelle wanted more height but said it packed a punch while Bruno thought it was well executed. Tim: Triple Berry Upside Down Cake. Rochelle noted that Tim’s cake was buried in berries and couldn’t fine the cake underneath. Both noted that the cake was underbaked. Timothy: Pear and Lemon Dark Chocolate Upside Down Cake. Rochelle noted that Timothy needs to work on his knife skills and Bruno felt the cake had good chocolate flavour. Rochelle said it tastes better than it looks. Devon: Mango Gingerbread Upside Down Cake. Not what Devon had hoped it would look like. Bruno loved the flavour combination and Rochelle called it the best cake she has tasted so far. Mengling: Apple Pecan Bourbon Cake with Maple Caramel. Rochelle loved how the bourbon was a lovely accent to the cake. Sachin: Upside Down Chai Pear Cake. Rochelle noted the effort that Sachin took in decorating the cake prior to baking. Bruno noted the strong chai flavour and the pear could use more baking. Sadiya: Pistachio Cardamom Cranberry Cake. Rochelle noted that cake was heavy due excess oil but Bruno enjoyed the flavour combination. Megan: Mango Berry Upside Down Mint Cheescake. Rochelle liked the look of it and though the mint cheescake was delicious. How I would have fared: Don’t think I’ve ever made a chiffon cake and like Wendy, I do know what it is but I am not 100% sure what it looks like. I am guessing it is like an Angel Food Cake. I probably would do okay on the cake but do terrible on the candied fruit aspect. What I would bake: I would probably make it for my older niece. I would do a chocolate mint cake and white chocolate cake with vanilla butter cream. I would do a Harry Potter theme and do it around her house: Hufflepuff. I would wrap the outside with yellow and black fondant icing. On top would be a fondant badger. While not exactly a birthday cake, I did bake a triple layer chocolate cake with the Twitter logo on it to celebrate a milestone for my former workplace’s Twitter handle. I love Wendy’s because it has to do with Anne of Green Gables. Mengling’s sounds disgusting. Sadiya’s cake looked fun and Tim’s and Sachin’s sounded delicious as I love that flavour combination. Megan’s looked pretty cool. Wendy: Anne of Green Gables cake with raspberry cordial frosting over three layers of chocolate and lemon polka dots. Bruno loved the lace around the cake but felt one of her cales was too dense. Mengling: Blueberry Lime Naked Cake. It has four layers and a hint of basil. Rochelle thinks the gold lustre on the fruit makes it looks festive and calls the flavours divine. Ann Marie: Happy Hour cake with Stout and Whisky cake with a chocolate collar and pretzels. Bruno liked the pretzel combination and Rochelle didn’t feel too drunk from the whisky. Devon: Coconut Matcha cake. Bruno noticed the sponge was dense but liked the flavour. Timothy: Remains of a Phoenix cake with chocolate cake and raisin spice cake topped with chocolate cookie ashes. Bruno loved the feather decoration and think the cake works well. Rochelle felt the concept didn’t come together. Sachin: S’mores Birthday cake. Bruno liked the flavour but both noted that it was too sweet. Megan: Chocolate and Vanilla Day of the Dead Cake. Rochelle called the cake stunning. Bruno called the cookies and cream cake spectacular. Initial thoughts. First off, how spoilery was that intro. The way it was edited, you can clearly see who makes it to certain weeks so you know that contestants you are rooting for were going to be safe. For example. you see Sadiya making bread when it clearly isn’t bread week. As for who I am rooting for? I am cheering for Mengling and Timothy because they are Asian and Andrei because he is from Vancouver. So I am relieved that Timothy survived but he really needs to step up or he won’t last long. I am happy that Andrei and Mengling were in the running for Star Baker with Andrei being crowned the first one. I think it is a bit early for me to predict who will be the winner but I think right now it might be Mengling, Sachin and Megan in the finale. 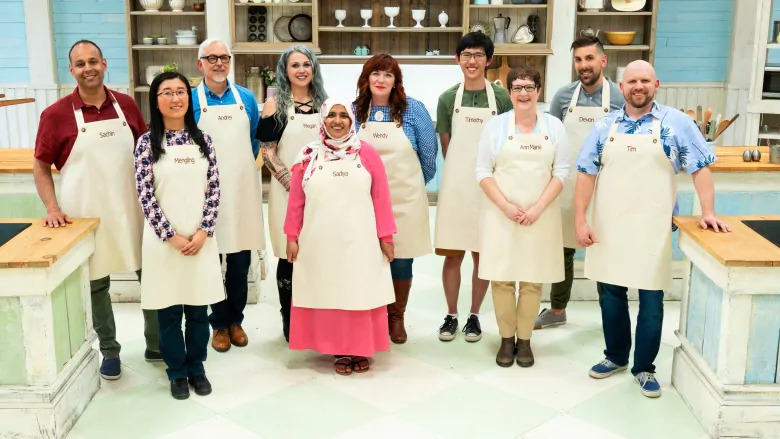 But after I watch every week, I will revise my prediction as I get to know the bakers and their skills. Next week is biscuit and bars week. And I have a feeling that Sadiya is going to be safe.